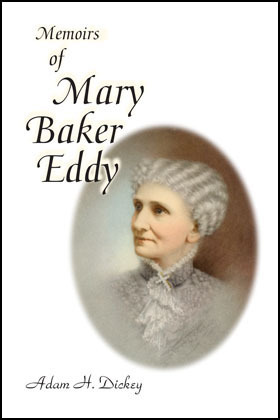 Mr. Dickey’s memoirs give a fascinating firsthand account of his experiences as Mary Baker Eddy’s secretary. He wrote his memoirs because of a promise she asked of him: “If I should ever leave here, . . . will you promise me that you will write a history of what has transpired in your experiences with me, and say that I was mentally murdered?” Sixteen years later, Mr. Dickey kept his promise by writing this account from the diary he kept while living in Mrs. Eddy’s home. Mr. Dickey passed on before the book was finished, without fulfilling her special request. The unfinished manuscript was published in 1927 by his wife, and was in circulation only a brief time before the Board of Directors acquired the copyright in 1932 and buried it in the Church archives. In the Memoirs, Mr. Dickey relates many of the challenges confronting those called to help Mrs. Eddy in her home. He gives a firsthand account of Mrs. Eddy raising Calvin Frye from the dead, and tells of the seemingly insurmountable obstacles that Mrs. Eddy faced during her last years as she worked to secure the future of the Cause.